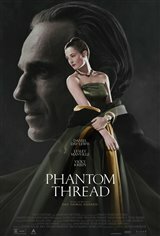 Fashion designer Reynolds Woodcock (Daniel Day-Lewis) is a famous dressmaker in 1950s London, England. He lives with his sister, Cyril (Lesley Manville), who runs the business, and has his life nailed down to a science. He's meticulous and finicky in his day-to-day routine, but all this is thrown into the air when he encounters a headstrong young waitress named Alma (Vicky Krieps). Alma is stubborn and very different from anything Reynolds is used to. When he brings her home, she throws his life into an interesting disarray as she becomes his muse and eventually his lover.